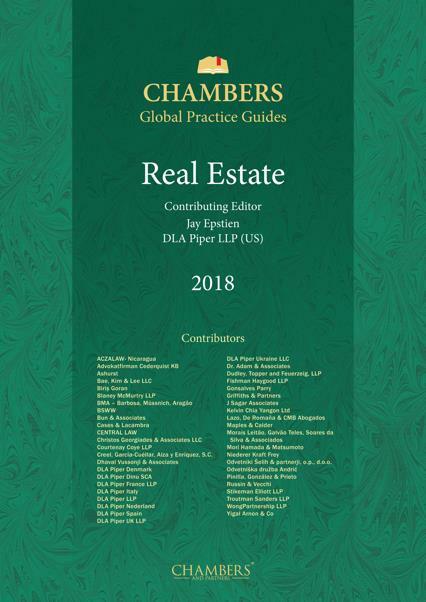 The Real Estate guide provides expert legal commentary on the key issues for businesses involved in the real estate sector. The guide covers the important developments in the most significant jurisdictions. DLA Piper LLP (US) has a market-leading real estate offering, an international multidisciplinary team of lawyers that can serve clients' needs across the real estate sector. The firm has over 500 real estate lawyers operating in more than 30 countries across the world. Lawyers are able to serve clients in key real estate markets with strongly established teams in Europe, Asia Pacific, the Middle East, Africa and the Americas. DLA Piper works with clients at all stages of the real estate life-cycle including planning, acquiring, finding, developing, leasing, completing, trading and divesting. The team offers the following services: financing; acquisitions and disposals, asset management, construction, development, planning, zoning and environmental, joint ventures, fund formation, restructuring, tax structuring, forward funding and disputes. The team works alongside investors, lenders, developers and managers in every aspect of their real estate activities, advising on matters from fund formation and establishing investment platforms for clients moving into new markets for the first time to cross-border portfolio acquisitions and restructuring loan facilities secured on assets in multiple jurisdictions. Real estate, probably more so than any other industry, sits at the confluence of supply, demand, liquidity and capital markets. In 2018, the industry continues to face significant disruption stemming from global political instability, evolving lending practices and regulations, shifting global investment patterns – and perhaps most significantly, the rapid effects of technology and innovation. In recent years, several significant changes to real estate lending have been created − most importantly Basel III, which reduced the amount of lending by banks to the real estate sector by imposing higher-risk capital requirements. Under Basel III, the classification of loans as High Volatility in Commercial Real Estate (HVCRE), was a major factor in reducing construction, real estate development and acquisition lending by commercial banks, as it required them to reserve more capital for each dollar lent, thus reducing the amount of dollars available for lending. In addition, Dodd-Frank required issuers of Commercial Mortgage Backed Securities (CMBS) loans to retain a 5% portion (horizontal or vertical) of each loan. A year ago, expectations were that the volume of CMBS issuance would drop because of these increased regulatory requirements − but CMBS issuance in the US in 2017 actually increased over the prior year by 26% to USD95.3 billion. The 2018 outlook appears more conservative with 14 market professionals predicting a drop from the 2017 levels and, on average, an expected volume of USD75 billion in the US. Of course, overall liquidity is affected by the ever-shifting changes in the global political landscape. Brexit negotiations remain in early stages and likely have not yet had a material impact on global real estate investors. Moreover, while the US political situation appears more unpredictable than ever, Congress passed the Tax Cuts and Jobs Act (TCJA) at the end of 2017, the most significant tax reform legislation in 31 years, and the US stock market remains at record levels. The TCJA contains many other provisions that could affect CRE investment, including, for example, capping the amount of state and local taxes that can be deducted by individual taxpayers to no more than USD10,000 per year. The Real Estate Roundtable said this change could hurt demand for CRE in many regions of the US and undermine local revenue bases that support critical services in local communities. As noted last year, the Financial Accounting Standards Board (FASB) issued a ruling requiring US businesses to disclose lease obligations for real estate and other major assets directly on the balance sheet by 2019. The ruling was designed to ensure transparency and end off-balance sheet accounting for major liabilities. According to FASB, the world will add USD2 trillion of debt to company balance sheets over a five-year period. The new regulations will affect how real estate is accounted for, as well as affecting debt covenants with banks, and may result in a shift to lease terms of less than one year in duration (office sharing) as well as impacting lease-versus-buy decisions. To comply by 2019, companies have begun recasting accounting treatment of lease obligations, as well as reviewing their bank covenants. These changes are expected to have a wide impact on both lessees and lessors. As a result of continued low interest rates around the world, public REITs, pension funds, sovereign wealth funds and other capital-providers have increased allocations to real estate. In addition to direct real estate investments, the increased sophistication of the debt market has brought more money into varying aspects of real estate debt, either through CMBS or through traditional or non-traditional (shadow) lenders. Although the popular press discusses players exiting the business, others continue to invest in real estate as a safe and secure vehicle that also diversifies their investment portfolios. Notwithstanding the unpredictability of the US political landscape, foreign capital continues to be drawn to CRE investments in the US and other markets for many reasons, including predictability of cash flows, transparency of market information, relative downside risk protection and liquidity. In addition, the FIRPTA changes adopted in the PATH Act of 2015 improved the investment platform for institutional flows of foreign capital to the US. While identifying attractive investment opportunities in the US remains challenging, it continues to rank as the primary investment target country for 70% of foreign investors in a recent survey. While China continues to be a major investor in real estate in the US and internationally, the guiding opinions promulgated by China's State Council on 4 August 2017, which divided China's outbound investments by sector into “encouraged,” “restricted” and “prohibited” categories, has had a cooling effect on the level of investment emanating from China. In particular, foreign investment in real estate was placed in the “restricted” category. However, Korean investors increased their pace of international investment in 2017 and the Canadian investors and other international players remained very active. In the end, the pace of acquisitions by the top 50 global investors slowed by 2% in 2017, although this group increased its exposure to CRE at a faster pace in 2017 than 2016 (as a result of reduced dispositions of real estate assets). There can be little doubt that CRE markets, like most of the rest of the world, are in a dynamic state of disruption driven by rapid technological evolution, innovation and easy access to capital. Growth around the world of WeWork and other co-working providers is nothing short of miraculous. In addition to becoming dominant tenants in New York, London and other major office markets, owners of office properties have adapted by building furnished spec suites with shared amenities to accommodate start-ups and others as they outgrow co-working spaces. Developers of office and multi-family properties, together with urban planners and local land-use regulators, are working to understand the impact of autonomous vehicles coupled with the growth of ride-sharing services. This leaves us with some pressing questions: what will parking garages look like in ten years? Will there even be parking garages? Retail real estate faces the greatest challenges. As Amazon expands (recently entering Australia), traditional brick and mortar retailers must adapt and innovate to survive. Regional malls must continue to adapt as 30-year operating covenants for anchor department stores expire, making repositioning strategies critical. Even in the world of grocery-anchored community centres, uncertainty prevails as owners, developers and tenants await the impact of Amazon’s 2017 acquisition of Whole Foods Market, the US entry and rapid expansion of German grocer Lidl, and the evolution of experiential retail. Finally, the importance of demographic shifts and infrastructure investment cannot be ignored. The world’s population is growing and the great demographic shift from rural to urban, 18- and 24-hour mega-cities is unceasing. These factors, plus the ageing of extant infrastructure, globalisation of supply chains, and changing technology are creating sweeping opportunities for the public and private sectors. Indeed, these changing demographics demand increasing investment in infrastructure, virtually everywhere in the world – a major investment opportunity of possibly as much as USD9 trillion by 2025. Real estate is subjected to extreme differences in legal, regulatory and tax matters across the globe, and this brief overview highlights only some of the most significant issues. In the end, real estate remains local by nature and, as a result, it is of utmost importance to consult with local counsel and other expert advisers in each jurisdiction where an investment will be made.